I know this is a step that many people may find kind of cheesy and silly, but you would be amazed at how much it can help you out. It’s especially good for curbing those impulse buys. Sure that table is beautiful, but will it fit into your overall design? Is it something you are going to love for years to come? If not, leave it in the store and save your money. The easiest way to determine your style is to look through your collection of items and make a list of descriptive words that match what you have. Continue to narrow down those words to a select few that describe the majority of your collection. It doesn’t necessarily have to be one word. 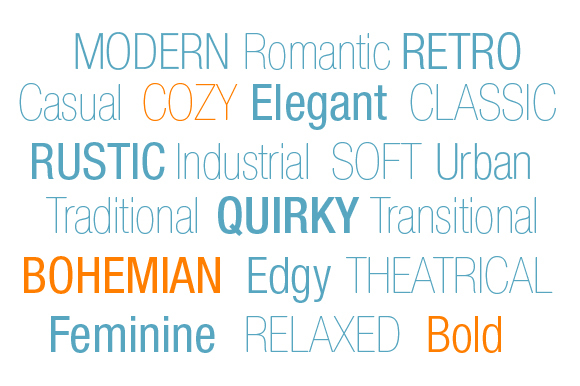 It could be a combination of words like, Bold Bohemian with a touch of Modern. It’s up to you. I myself love creating olioboards for various styles, but when it really comes down to it, I prefer a more relaxed lived in look over anything else. I love items with a bit of wear and tear over the latest modern designs. More than anything, I want people to be able to come over and feel like they don’t have to watch where they sit or where they put down their glass. I guess I would consider my personal style to be, Rustic Farmhouse with a Modern and Romantic twist. You’ll find that your style is most likely going to change through the years, so it’s a good idea to revisit this step from time to time and re-evaluate what makes you tick.